There's a fat, furry, tan foot creeping over the edge of the pot in the hanging basket over my desk. No cause for alarm. It just shows that my plant is growing happily. That foot is a hairy, creeping stem of rabbit's foot fern. Taking the basket down off its hook, I see that the plant has other feet. They are making their way to the edge of the pot. New leafy fronds spring forth from the topsides of these feet. Besides its interesting feet, rabbit's foot is, among ferns, relatively easy to grow. Ferns became popular houseplants during Victorian times. That's because of their lushness and tolerance for relatively dim conditions. In those days, however, homes were cooler and moister. Just what ferns like. 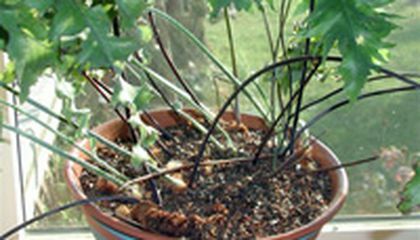 Rabbit's foot ferns can tolerate drier and warmer conditions than most other ferns. Their natural habitat is in southeast Asian jungles. These ferns nestle between rocks or in the crotches of trees, rather than growing in soil. Rabbit's foot is not the only fern with feet. Common names of some of its relatives include deer's foot fern, squirrel's foot fern and Polynesian foot fern. Rabbit's foot, though, is the most commonly offered of the lot. It's also thought the best because it is evergreen and has the largest feet. Squirrel's foot fern, incidentally, has red "fur." I attribute the health of my fern to the good drainage of the potting mix in which it grows and the cool, bright room that it calls home. Any potting mix can be made similarly suitable for this plant with some extra perlite or gravel. And the pot must, of course, have drainage holes. The plant's exuberant growth is striking. Mine started out in a small pot at a western window. That was a couple of autumns ago. A slightly larger pot and the brightness of spring then spurred 2-foot-long fronds. They threatened to gobble up that corner of the room. Or at least push the plant off the windowsill. The plant has since moved again. Now it's in a large hanging basket. It can freely spread its lush, 2-to-3-foot-long, rippling fronds in all directions. You might wonder what I'll do when all the rabbit's feet this plant can muster have bailed out of the pot. That's when I'll make new plants. To achieve that, I'll merely cut off some pieces of feet with roots attached and press them, without burying them, into fresh pots of soil. Rabbit's foot ferns, like rabbits, multiply quickly. Critical thinking challenge: Name two things that rabbit's foot ferns have in common with rabbits. Rabbit's foot ferns have big hairy feet that climb out of their pot. They first became popular in Victorian times when houses were much cooler with more moisture. It's relatives include the deer's foot fern, squirrel's foot fern and Polynesian foot fern. To keep your fern friend healthy, drain the potting mix regularly and place it in a cool, bright room. Any potting mix can be used if some extra gravel or perlite is added. Use a pot with draining holes. And, of course, give it plenty of extra room to grow. I think the rabbit's foot fern sounds like a really cool plant to own and I never knew that plants could have feet. i think it is cool because most plants dont look like that, but at the same time it is kinda creepy cause most plants dont do that and to a new person that never went to your house it would creep them out. 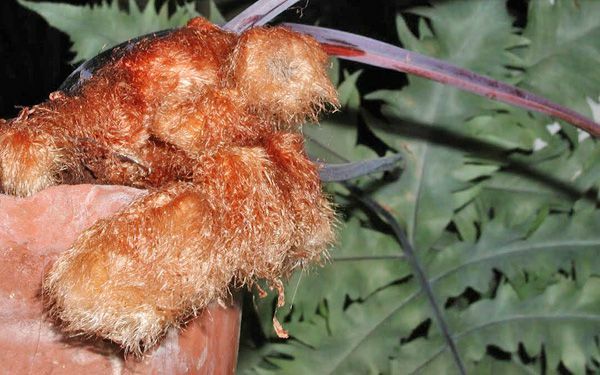 First off the is creepy and why did rabbits feet sticking out of it it's mouth or what ever.I could not figure out if in the story that if they gave it to the plant or it got it on it's own but that picture was pretty scarey to me a LOT. This is an article based on opinions. Some people may think that it is cool and some people may think that it is creepy. In my opinion it looks really creepy. I think this plant is cool because it has a rabbit fern and it looks like hairy animals eating. It looks like a hairy finger. They call this a rabbit foot, because its red fur and its really furry and its easy to grow. There to2 to 3 ft long. Rabbit foot fern is a fat , tan and harry plant hanging over a pot.the plant leaving over the pot shows the plant is growing happy. Rabbit fern is among The relatively easy to grow. ferbs become easy popular during the Victorian times because of there lushness and tolerance for relatively dim conditions.